There is a modern air source central heating system with underfloor heating downstairs, making this a warm and inviting place to stay throughout the year. There is free wi-fi provided in the house. Hall: with a tiled floor and cloaks area. Kitchen/dining area: a fabulous contemporary light and spacious kitchen with glazed doors leading out to the garden. 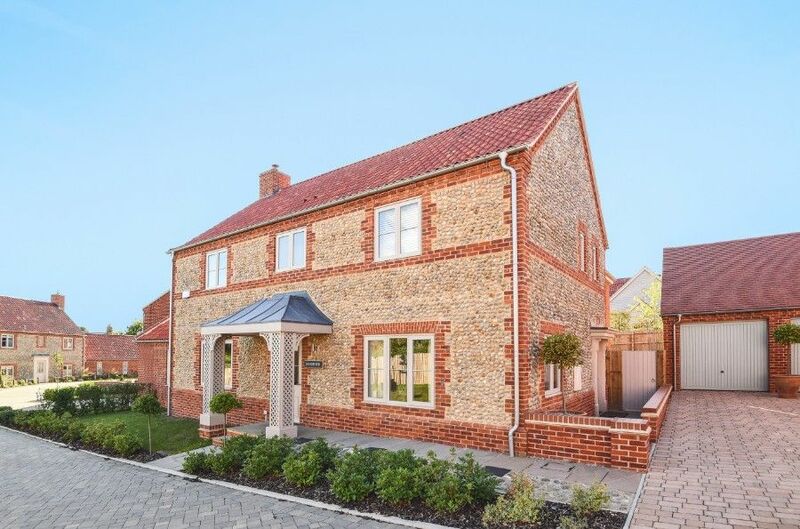 This high-specification fitted kitchen is extremely well-equipped and has a large Bosch induction hob, two fan-assisted electric ovens, full height integrated fridge/freezer, integrated dishwasher, microwave and Nespresso machine. It has the advantage of all new crockery, cookware, glasses and cutlery. Up to ten guests may comfortably dine around the generously sized table with bench seats along each side and chairs at each end. For casual dining there is a breakfast bar with two stools. Utility room: convenient room with a washing machine, tumble dryer, sink and additional cupboards. Sitting room: a gorgeous room with a vaulted ceiling with painted beams and French doors to the garden. There's a large L-shaped sofa, two armchairs and a flat screen TV. Shower room: high quality contemporary walk-in shower, hand basin, WC and heated towel rail. The staircase is straight, not steep, with a hand rail. Master bedroom suite with TV: luxuriously appointed with emperor size bed, bedside table and lamps, wardrobe and dressing table with walk-in dressing room. En-suite shower room: with shower, hand basin and WC. Bedroom 1: beautifully presented room with a king-size bed, bedside tables and lamps, wardrobe and a dressing table with stool. En-suite shower room: contemporary with a fully tiled walk-in shower, hand basin, heated towel rail, WC and underfloor heating. Bedroom 2: another beautifully presented room which has zip-linked beds which may be configured as a super king-size bed or twin beds (3'), beside tables and lamps, wardrobe and a dressing table. Bedroom 3: another beautifully presented room which has zip-linked beds which may be configured as a super king-size bed or twin beds (3'), beside tables and lamps, wardrobe and a dressing table. Family bathroom: has contemporary white and chrome fittings, contains a bath, separate walk-in shower, hand basin, heated towel rail, WC and underfloor heating. There is the advantage of two private off-street parking spaces in front of the garage at the front of the house. The south facing rear garden is fully enclosed and private, with a lovely terrace and a good-sized lawn. For dining al fresco, there is an outside dining table with ten chairs and a barbecue. It is only a few minutes walk to Burnham Market's highly regarded village green with its great selection of independent shops, boutiques and galleries, as well as the renowned Hoste for delicious food and superb spa facilities. Please note that due to the high standard of this house, the security deposit is £350.00 and dogs are not permitted to stay.